Looking to enjoy your perfect day this summer? Then do it with a marquee from Weatherill Brothers. A semi-permanent marquee is a very flexible option, giving you greater scope to choose the venue of your dreams. 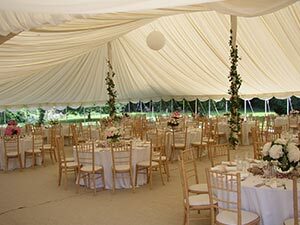 Whether it’s in the back garden at home, in the grounds of a stately home or on a farm, a hired marquee can be placed anywhere there’s some flat ground. If you’re looking for marquee hire in Norfolk, you’ve come to the right place. Get in touch and find out more about what we can do on 01953 882 394. Marquees can be designed in countless different ways, with a huge choice of styles, shapes, design themes, lighting and more. A marquee is a great way of having both an outdoor and indoor wedding at the same time. A marquee is an affordable option in a world where wedding venues can command very high prices. In a marquee, you won’t be restricted by the closing time of the venue, so you get to choose the time your party carries on until.